A series of rumours, placed classified ads, and texts placed inside cardboard boxes and left in public spaces. 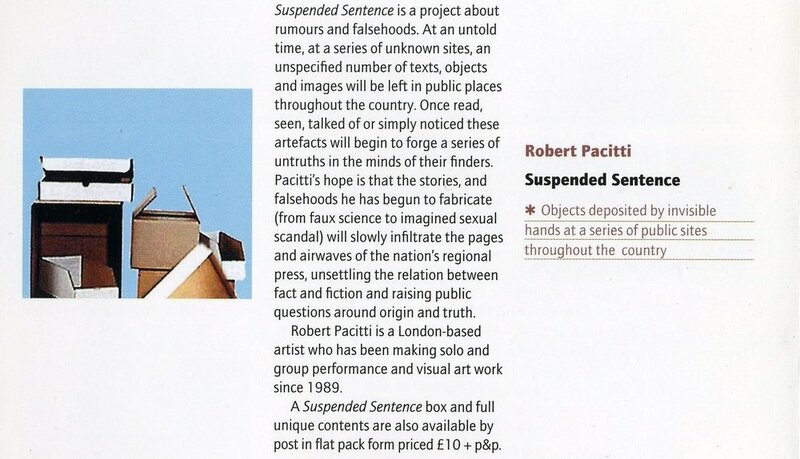 Suspended Sentence’ was a covert public project about rumours and falshoods and a contribution to the book Small Acts: Performance, the Millennium and the Marking of Time. At an untold time, at a series of unknown sites, an unspecified number of texts, objects and images were deposited by invisible hands and left in public spaces throughout the country. Once read, seen, talked of or simply noticed these artifacts were intended to forge a series of untruths in the minds of their finders. The hope was for the found stories and falsehoods to slowly infiltrate the pages and airwaves of the nation’s regional press, unsettling the relation between fact and fiction and raising public questions around truth and origin. A ‘Small Acts at the Millenium’ Commission through the Live Art Development Agency.